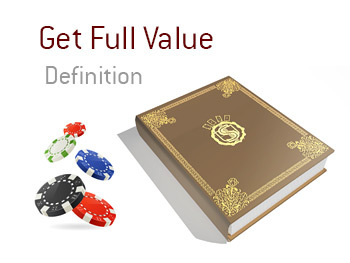 What does the term "get full value" mean in the world of poker? What is the definition of the term "get full value"? In poker, "getting full value" occurs when you extract the maximum amount of money possible from your opponent in a hand. When laying out a bet, raise or re-raise, a skilled poker player who believes that they are ahead in a hand needs to strategically size their bets in a way so that their opponents are compelled to call after calculating the pot odds. For instance, if you have top pair after the river card is dealt and you are fairly certain that your opponent has a middle pair, you will want to size your river bet so that your opponent feels compelled to call, even if they are sure that they are beaten. If your opponent is getting the right odds to call, they will likely call, even if they think that they are behind. This is called "getting full value" from your opponent and is crucial to gathering as many chips from your opponents as possible. Poker is not just about getting lucky and hitting the right card at the right time - instead, players must wisely accumulate chips, and "getting full value" in a hand is crucial towards doing so.